Highlighters are a relatively new addition to my make up collection - and since I've started using them, I've totally fallen for them. They've been getting particularly good use recently in the beautiful sunshine we've been having as they add a pretty shimmer to my cheekbones when they catch the light. 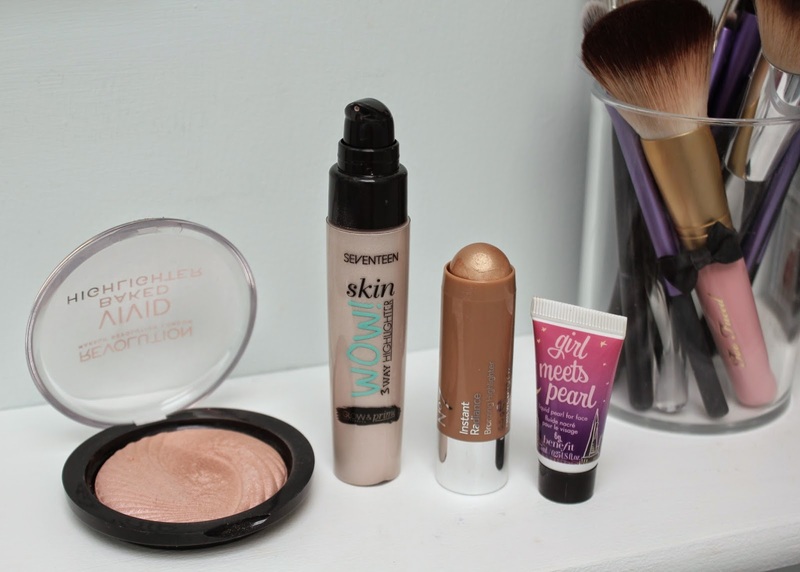 I thought I would put together a little roundup of my favourite highlighters for summer. I'll start with Benefit Girl Meets Pearl which I have a weeny 7.5ml tube of (it came in one of Benefit's trial sizes boxes at Christmas) but the normal size is 12ml. A little goes a long way with this goldy pinky pretty. It's a beautifully smooth cream which has a delicious fragrance (I love that about Benefit products) and great lasting power. Once it's dry it's not moving anywhere, which means that it's a great one for popping on in the morning and it should last all day. At £24.50 it's quite a pricey addition to your make up bag, so I'd say look out for a mini tube to try it out first. Next is the most goldy bronze of the highlighters the No 7 Instant Radiance Bronzing Highlighter*. I love the cute chubby stick packaging - it's just like their Pop & Glow Cream Blushes which I loved for being very handbag-friendly (which is useful because it needs reapplying after maybe 4 hours). The stick glides on really smoothly onto my cheeks and it's easy to blend it out and build it up. I'm particularly loving this one at the moment because it adds a really sunkissed glow to my cheekbones. At £9.95 (for 5.5g) it's the middle in my range of highlighters - but it should last a fair while so I'd say it's money well spent (especially if you can buy it with one of Boots' frequent vouchers). The Seventeen Skin Wow 3 Way Highlighter* is, as the name suggests, not just a highlighter. It can be used as a primer, or added to your foundation, or just as a highlighter. I have to admit I have only used it as a highlighter - for me I think it's probably a bit too shimmery to use as a primer, though maybe now the sun is becoming a more regular visitor I'll try this out. It's a decent sized 30ml for £5.99 so a good high street bargain. 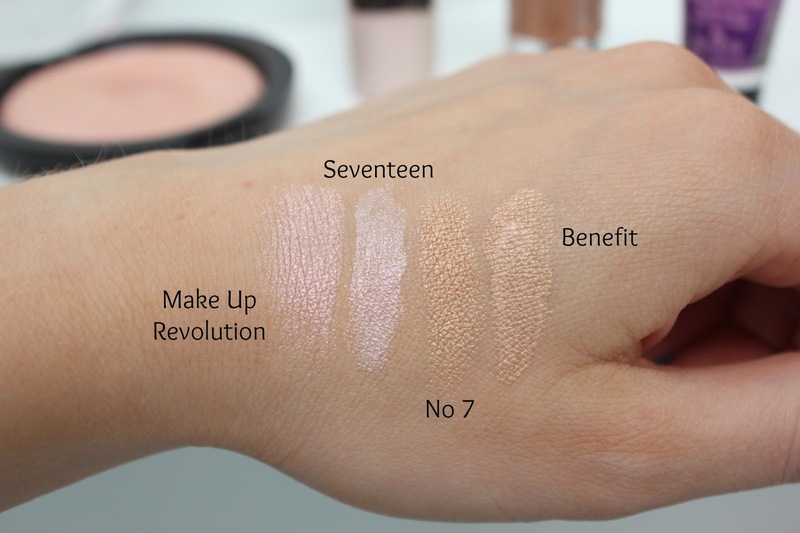 It has a thicker consistency than Benefit's Girl Meets Pearl and so takes a bit more blending out to look even - and even more so than the Benefit one, a little goes a very long way. 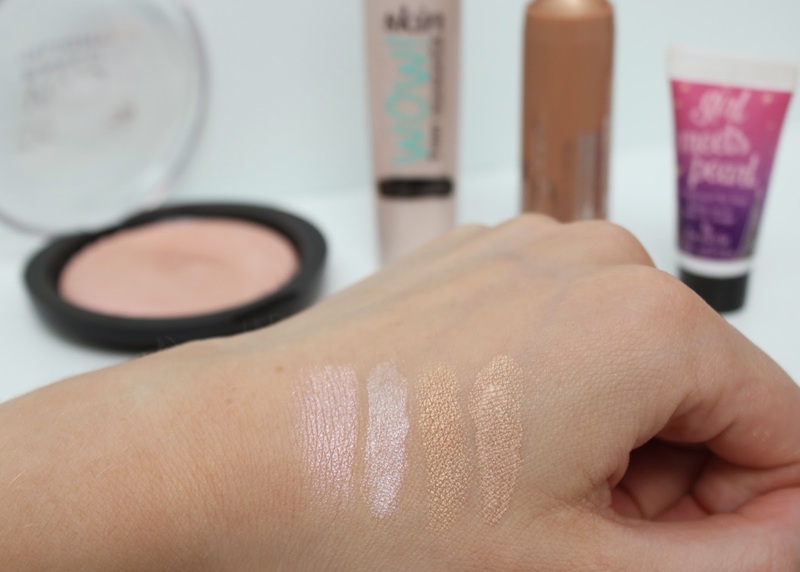 Colour-wise, it's the lightest most pearl-resembling ivory highlighter of the four in this post - I'd say more appropriate as a daytime highlighter as it may be too white for nighttime. I've already reviewed my Makeup Revolution Baked Highlighter in Peach Lights here but I wanted to include it in this post because at just £3 it's a total steal and a must-have addition to anybody's make up bag. It's the only powder highlighter in my post - and because it's a powder, I find it has a much less intense colour than the creams, but this does mean it's easy to build it up to the finish you want. It's a light pinky peachy colour - probably the most pink of the four in this post. Have you got a favourite highlighter? What is it? Have you tried any of these? Let me know in the comments below, or drop me a tweet @fundaflawless - I'd love to hear your thoughts! Definitely give them a go! They're a brilliant addition to my make up bag!